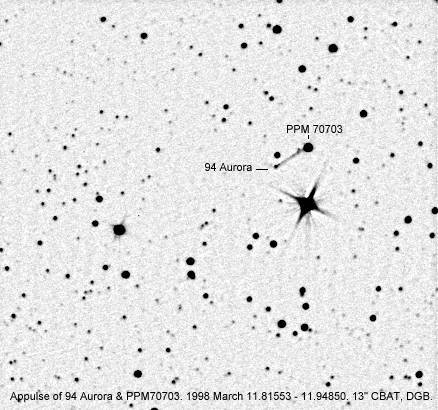 On 1998 March 11 the asteroid 94 Aurora was predicted to occult the star PPM 70703 as seen from parts of NW Europe. 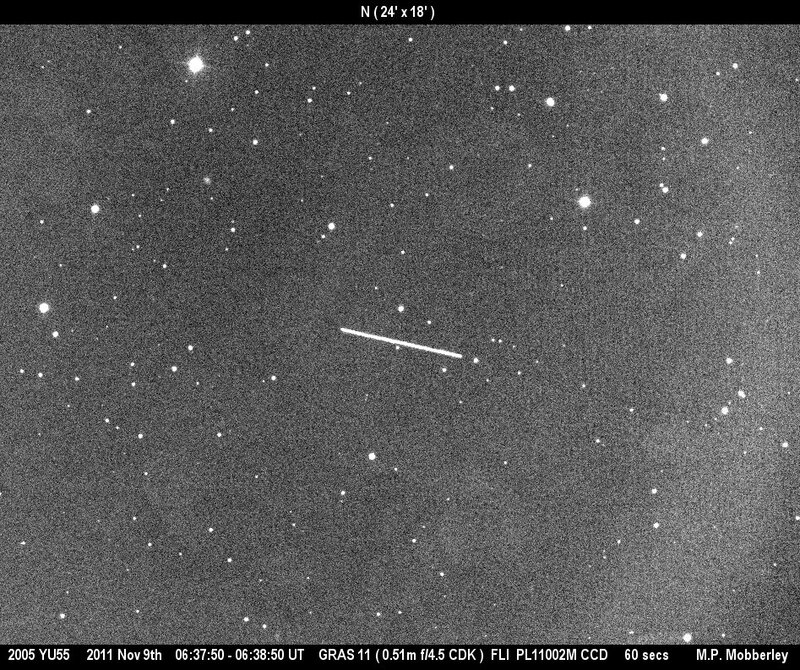 Denis Buczynski obtained this image using the 0.33-m Conder Brow Automatic Telescope. 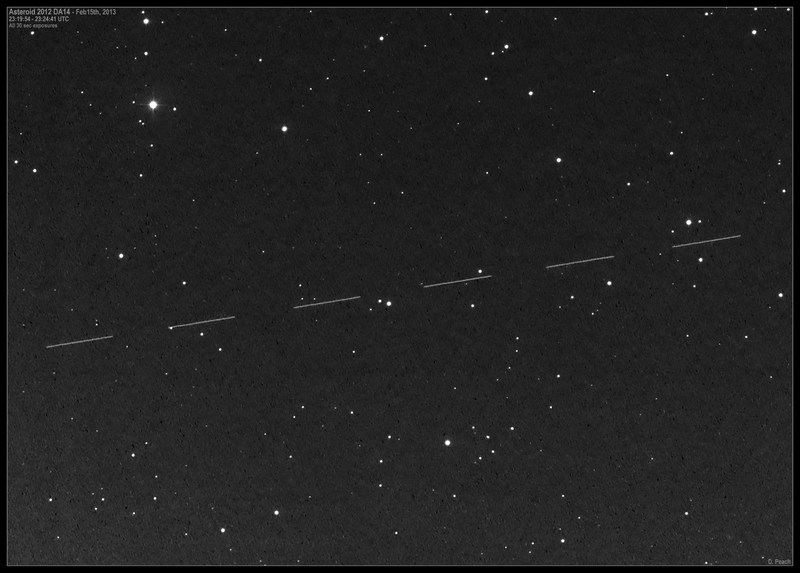 It is a composite of 21 CCD exposures taken between March 11.81553 and 11.94850. 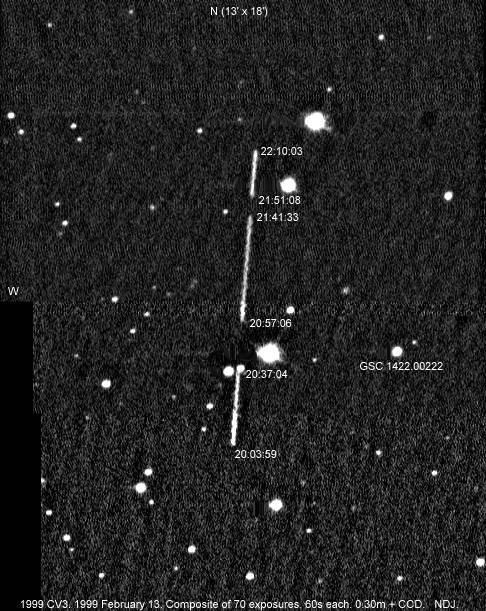 The trail of the minor planet can be seen heading for the star. 2004 January 28. Composite image by Maurice Gavin. 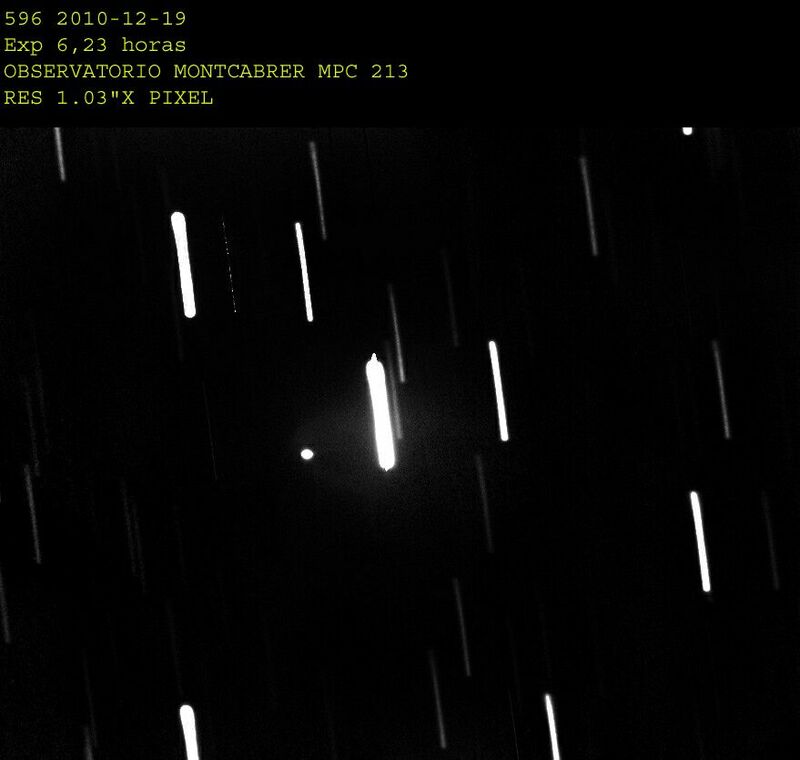 Images in outburst: 2010 December 13 (Mobberley), 2010 December 13 (James), 2010 December 14 (Mobberley), 2010 December 15 (James), 2010 December 15 (NLO), 2010 December 16 (Mobberley), 2010 December 19 (Campas). 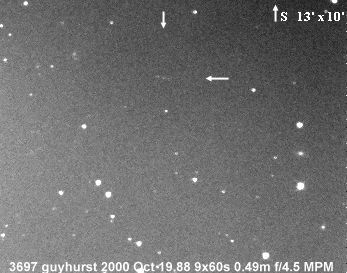 Martin Mobberley writes: After something of a battle, I tracked down asteroid 3697 Guyhurst (currently about 3 weeks past opposition, at ephemeris magnitude 17.3) this evening. 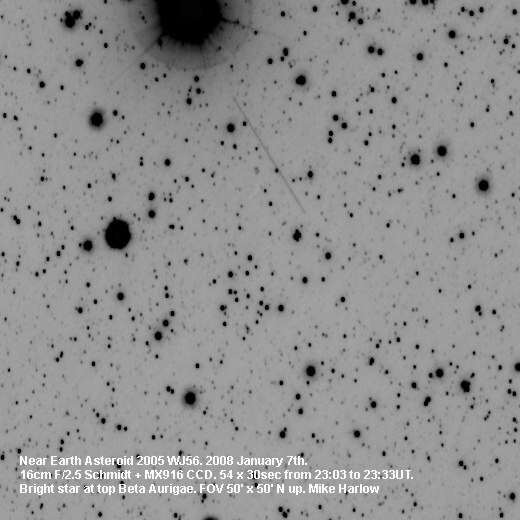 It's within a few arcminutes of the 0 hours RA line in Pisces. 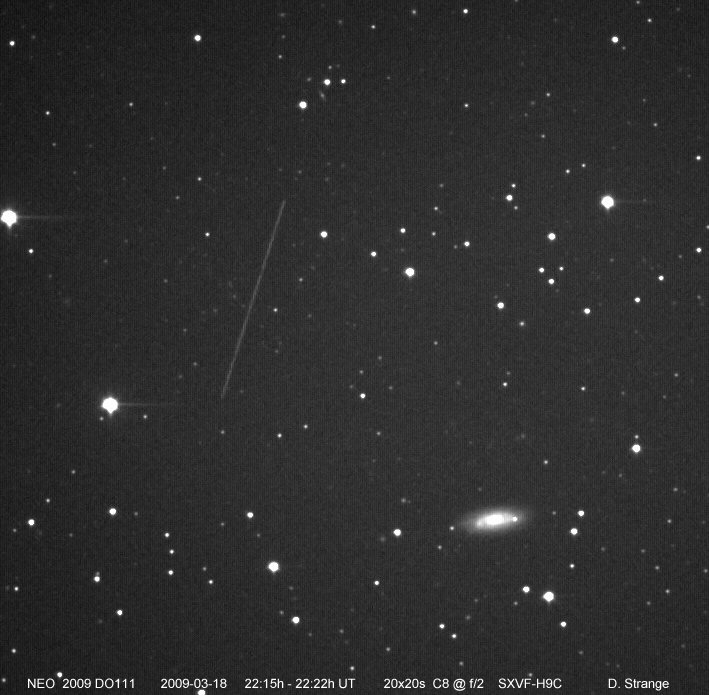 The attached image is a composite of nine 60 second exposures taken between 2036 and 2138 UT on 2000 October 19. 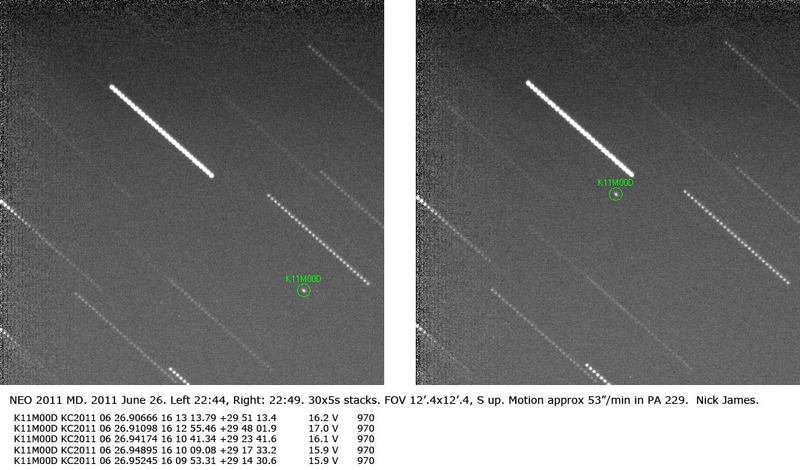 The asteroid was moving at 29 arcsec/hour in PA 256. 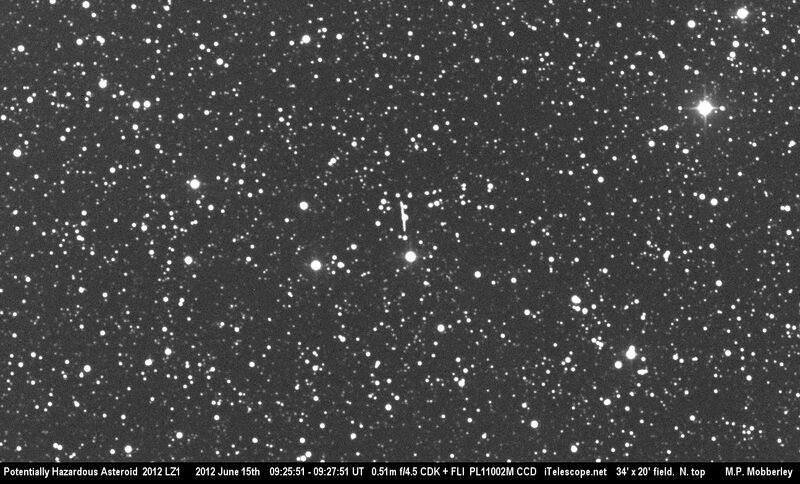 (0.49m f/4.5 Newt. 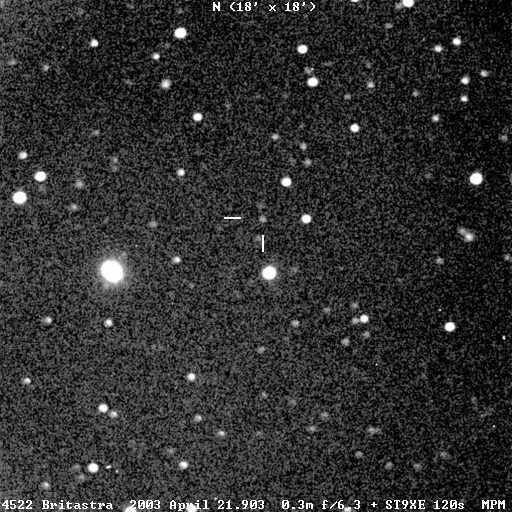 and MX916 CCD). 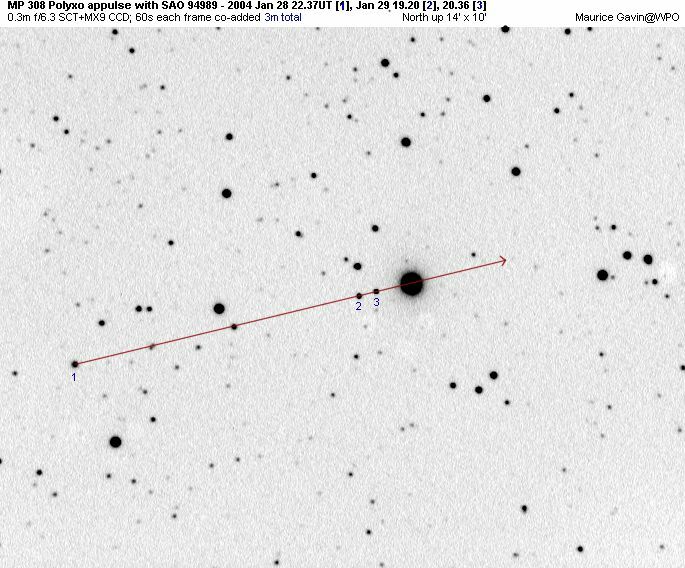 On 1996 November 29 4179 Toutatis passed just over 5 million km from the Earth. 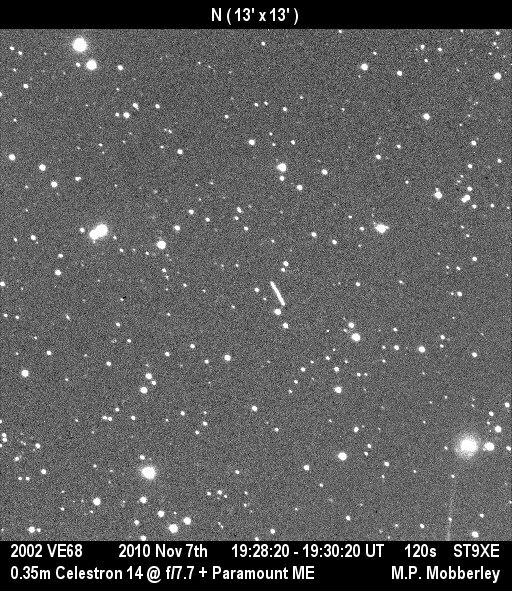 At that time it was not easy to observe since its elongation from the Sun was small. 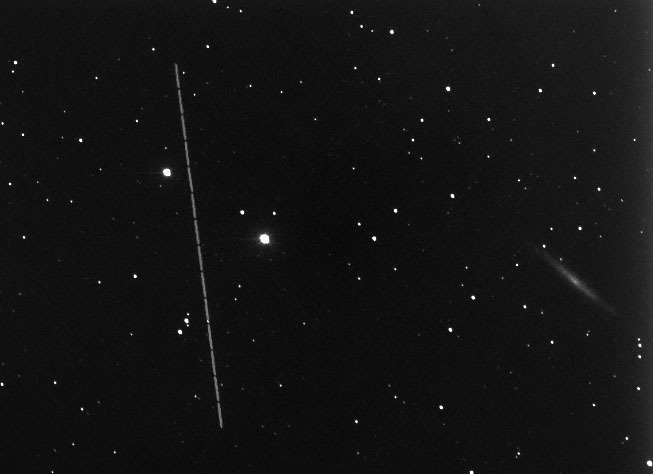 This image by Martin Mobberley shows the asteroid moving rapidly across the sky between 0015 and 0030 on 1996 December 14. 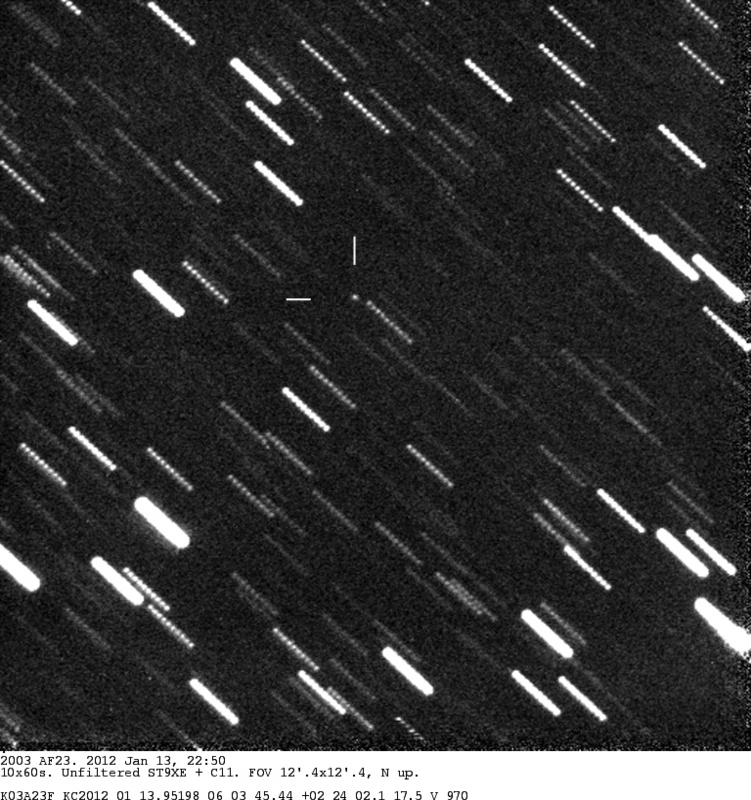 During the exposure the 12th magnitude asteroid moved by 60 arcsec. 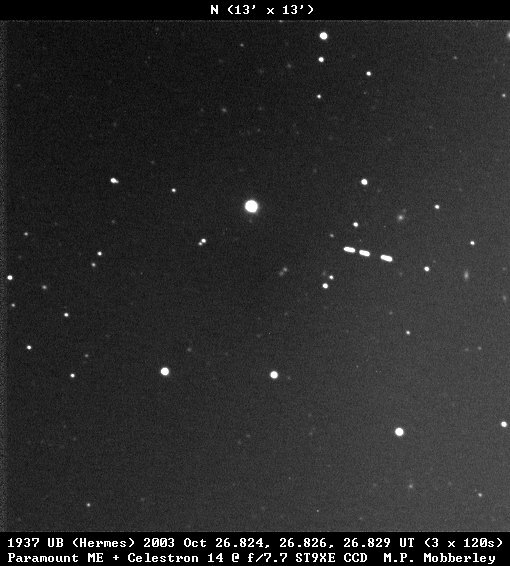 Takahashi E-160 + SXL8 CCD. 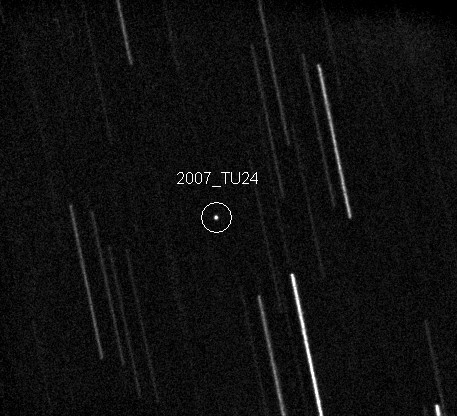 On 2004 September 29.5 Toutatis passes around 0.01 a.u. from the Earth. 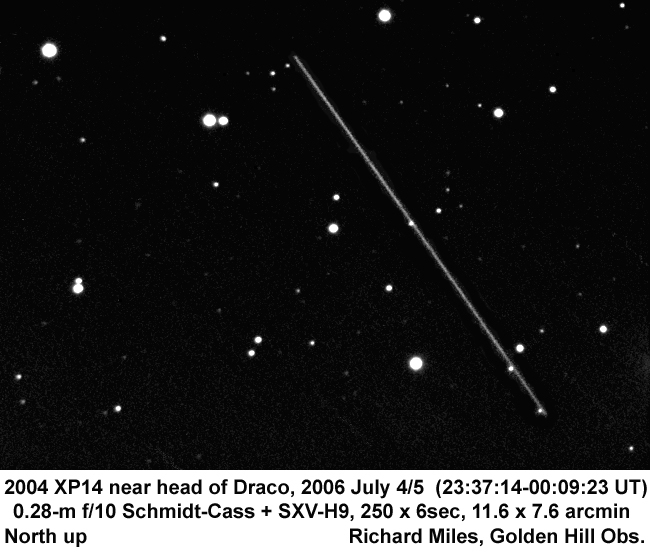 Images: 2004 September 18 (David Strange). 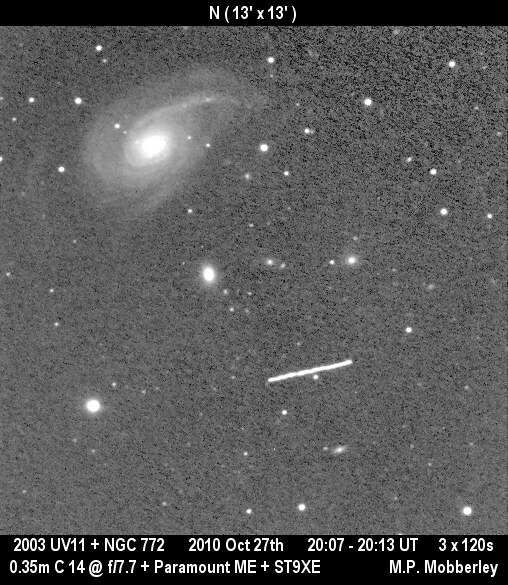 Imaged by Martin Mobberley on 2003 April 21. 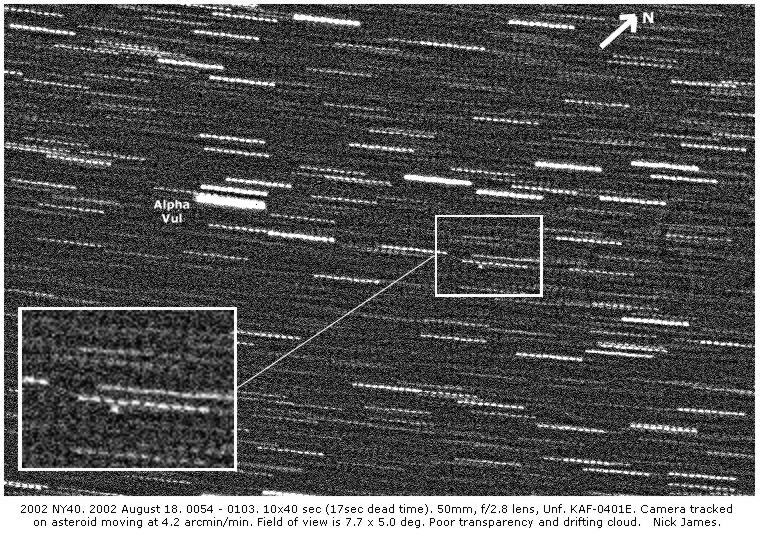 The following has appeared in MPC 29671 dated 1997 Apr 22: Discovered 1993 Oct. 8 by R. H. McNaught at Siding Spring. 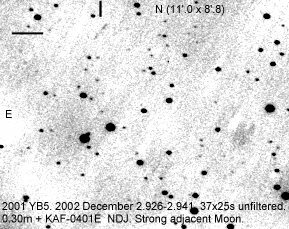 Named for The Astronomer, a British magazine in which active amateur astronomers publish and discuss their observations. 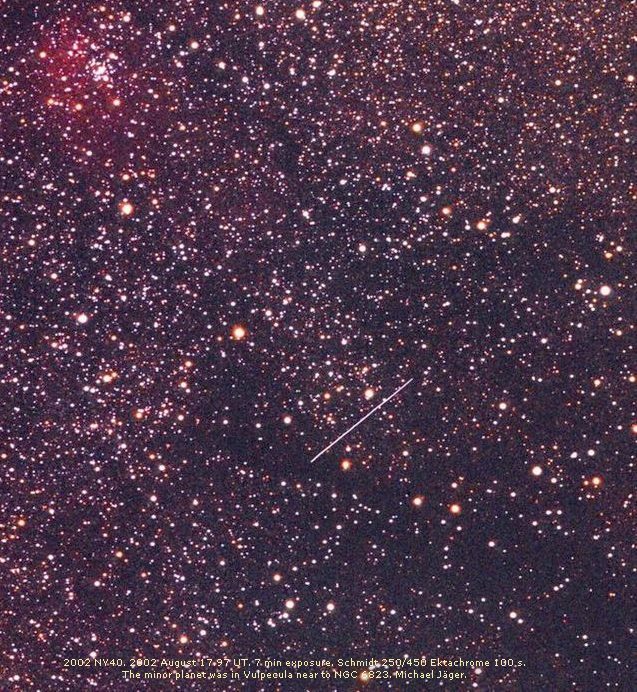 Founded in 1964 by James Muirden as The Casual Astronomer, the magazine has developed over the years to include rapid discovery announcements and many other initiatives by the current editor, Guy Hurst. 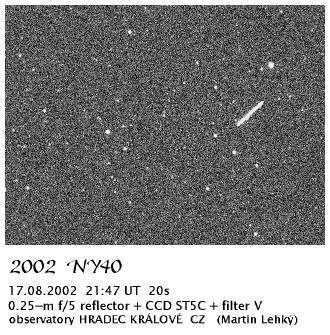 The search programs for novae and supernovae and the observational programs for cataclysmic variables initiated through the magazine have been most successful. The subscribers include many of the most active and talented amateurs in the U.K. and overseas. 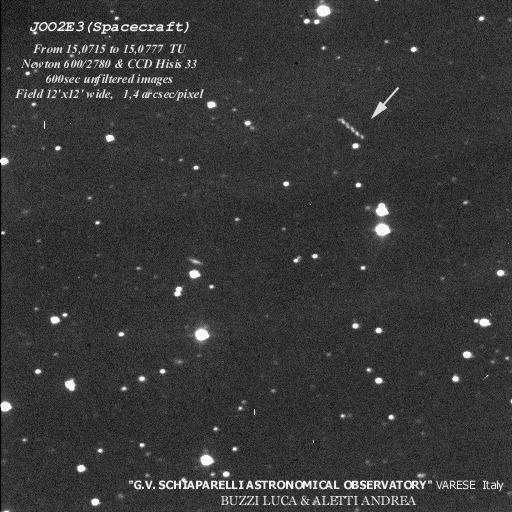 The discoverer's own interest in observational astronomy was spurred by TA. 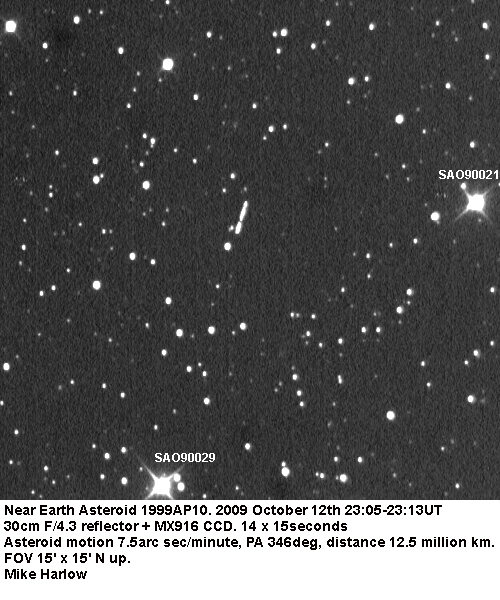 This asteroid was well placed in early 1999. 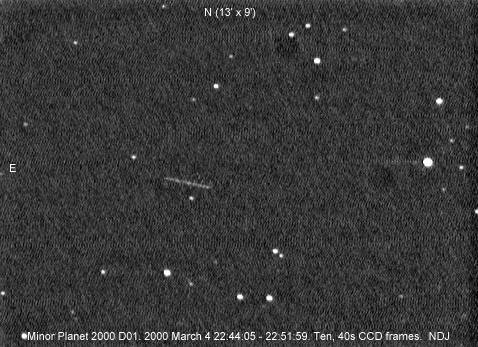 Martin Mobberley obtained this image on 1999 March 10 using his 0.49-m Newtonian and a stack of 20 exposures each of 30s duration. This frame is 4'x5' in area with S at the top. Discovered 1989 Oct. 4 by B. G. W. Manning at Stakenbridge. 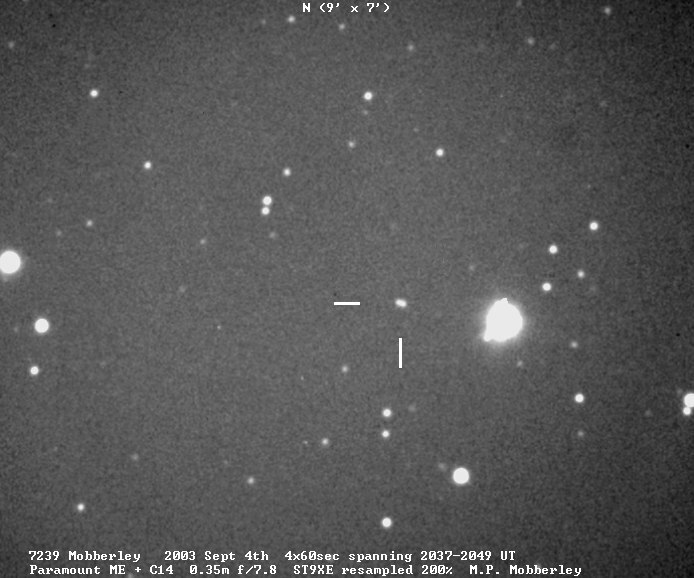 Named in honour of Martin P. Mobberley, photographer and astrometrist of comets, minor planets, variable stars, novae and supernovae. 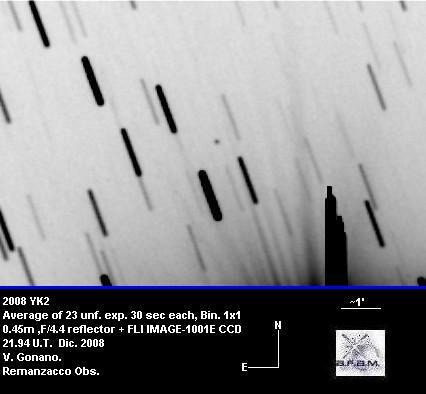 His fine photographs and CCD images have appeared in the Journal of the British Astronomical Association for many years. Since 1990 he has occupied the position of Papers Secretary to the Association, and as such he is responsible for arranging, refereeing and recommending articles for publication. 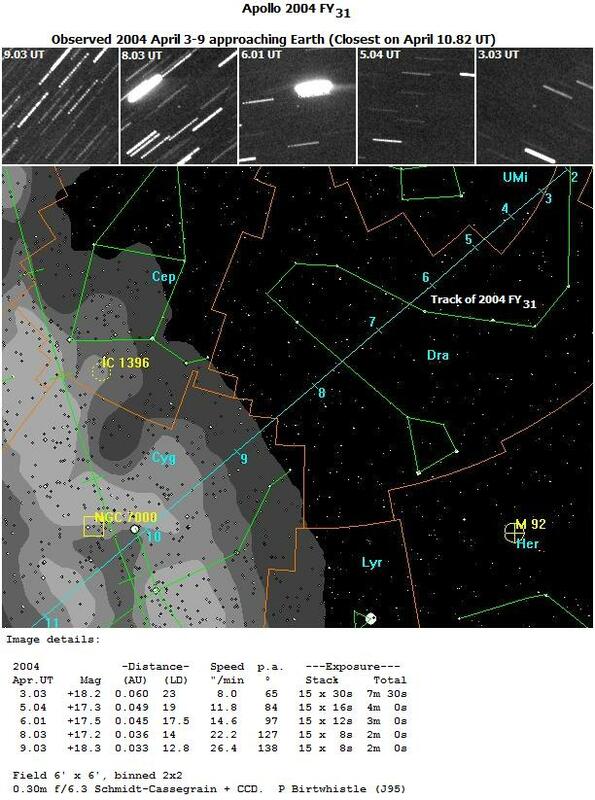 For the past six years he has prepared and given an entertaining short talk on currently visible sky phenomena at every monthly meeting of the Association. 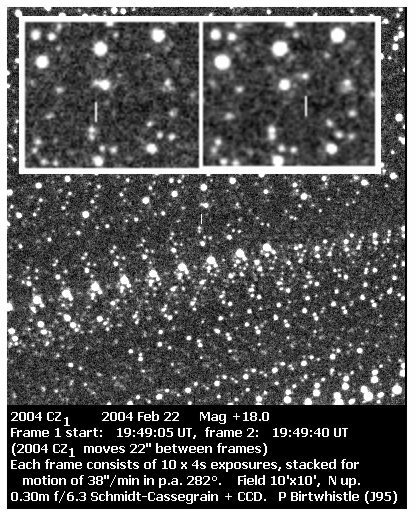 Mobberley is also assistant editor of The Astronomer magazine. 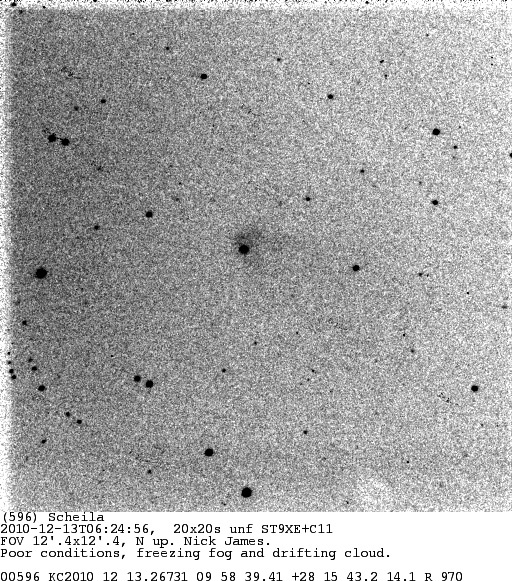 Image: 2003 September 4 (Mobberley). Discovered on 1991 January 12 by B. G. W. Manning at Stakenbridge. 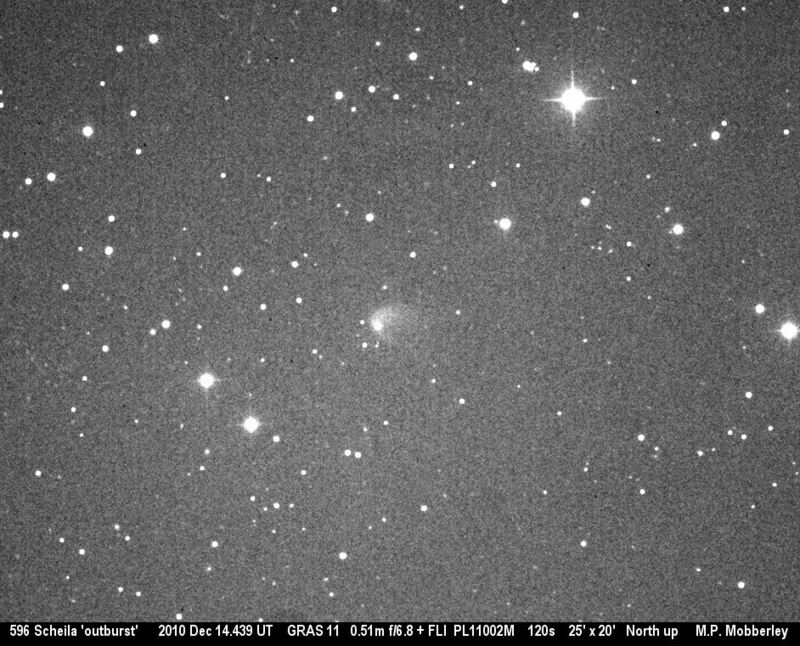 Imaged by Denis Buczynski on 2002 January 17 when it was around magnitude 17. Discovered on Christmas day 1995 by B. G. W. Manning at Stakenbridge. 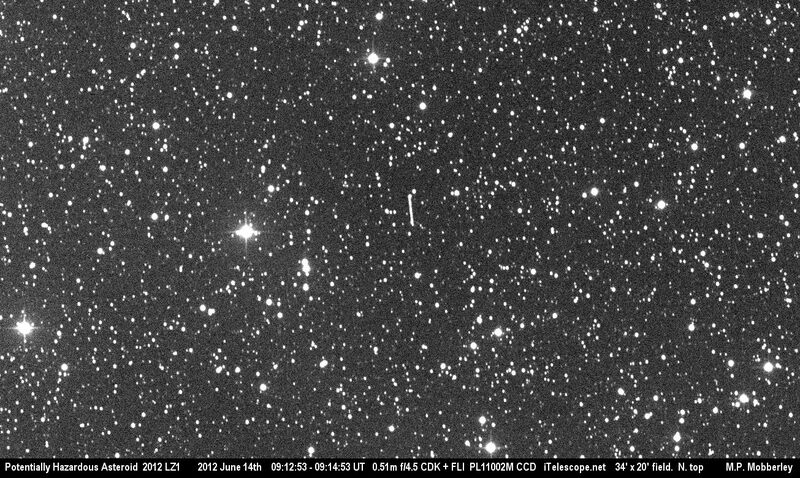 Imaged by Nick James on 2002 January 20 when it was around magnitude 17.6. 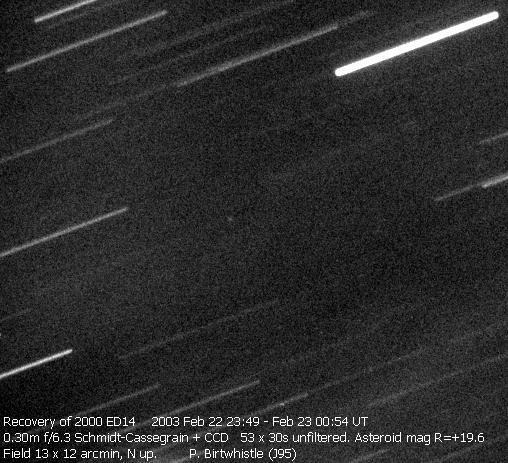 2002 March 9 when it was around magnitude 17.8. 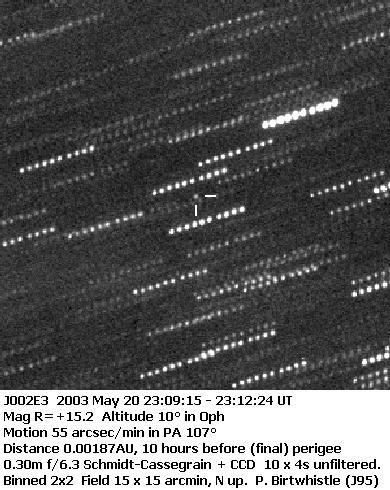 2003 May 25 when it was around magnitude 18.0. 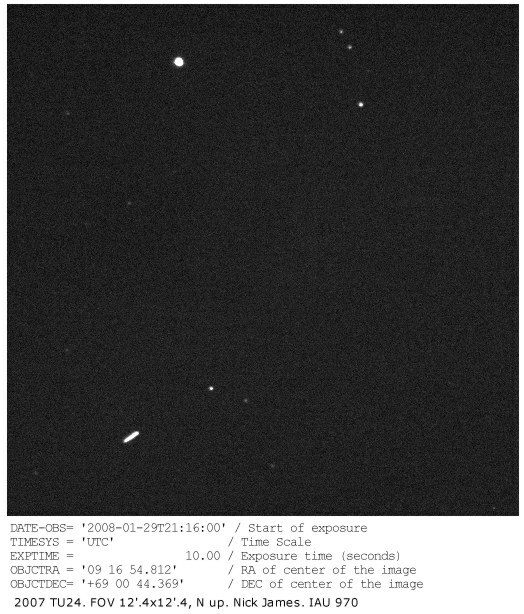 2006 January 21 when it was around magnitude 18.0. 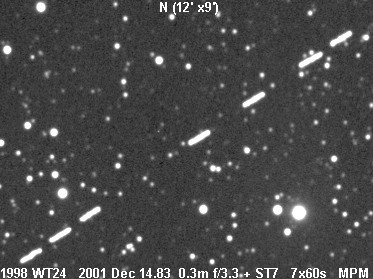 2006 December 12 when it was around magnitude 17.5. 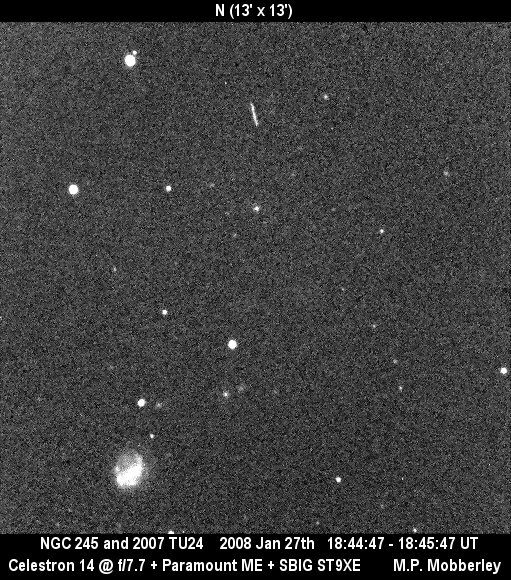 2007 January 14 when it was around magnitude 16.8. 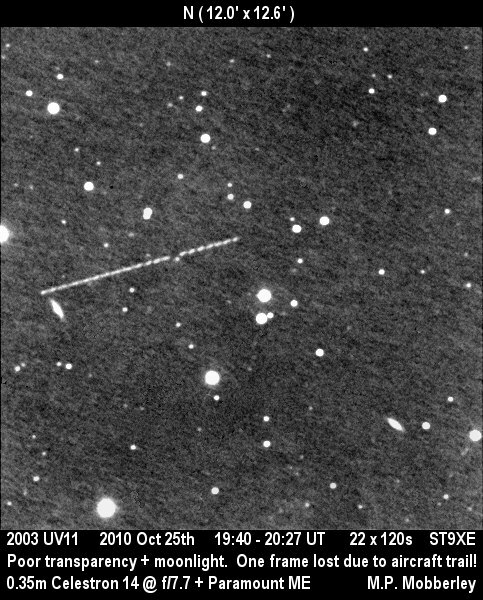 The long-lost asteroid was discovered at Heidelberg on two photographic plates taken on 1937 October 28. At the time the object had a daily motion of almost ten degrees and subsequent searches for it were unsuccesful. 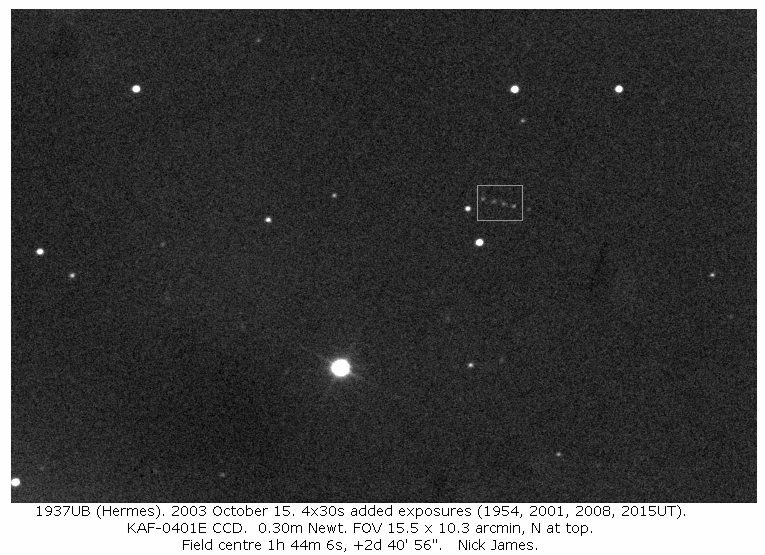 Hermes was lost until recently when Brian Skiff at Lowell detected a bright object at 14th magnitude in Cetus. 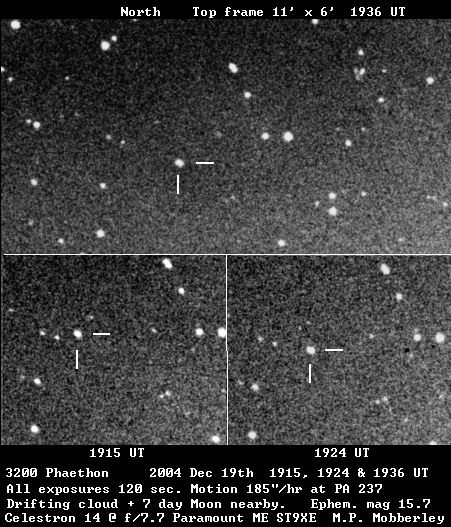 Rapid follow-up observations by other observers allowed an accurate orbit to be calculated and it quickly became apparent that this was the long-lost Hermes. 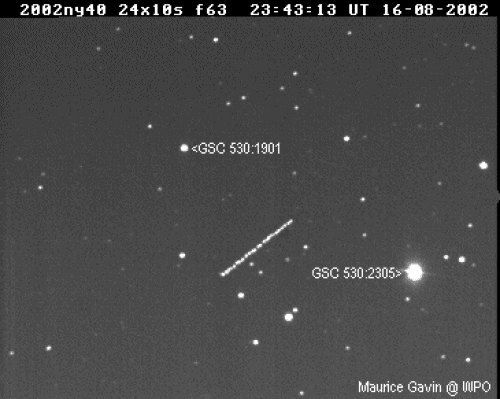 Images: 2003 October 15 (Nick James), 2003 October 26 (Martin Mobberley). 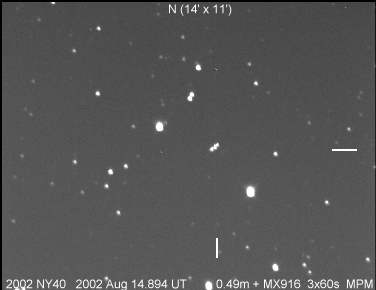 This asteroid was discovered on 1998 March 22 at the Lincoln Observatory, New Mexico and it magnitude 14 was unusually bright for a new discovery. 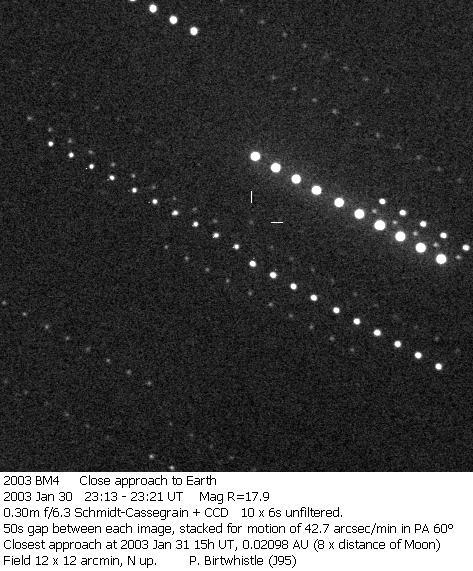 Its closeness to the earth meant that it had a relatively high apparent motion when this image was obtained on 1998 April 3. 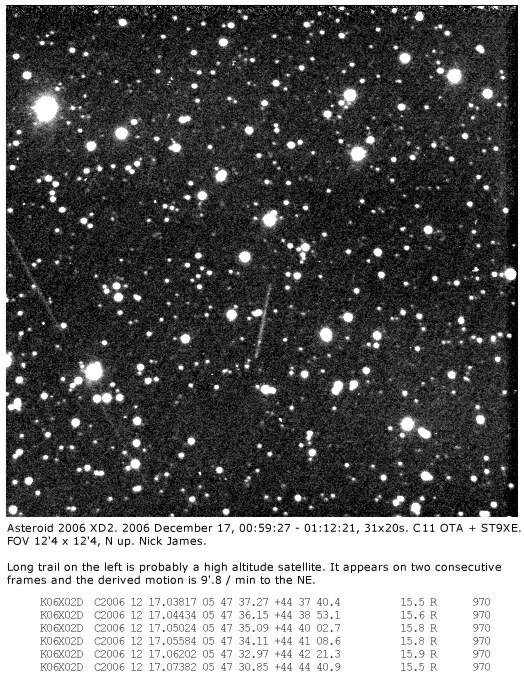 Nick James used a 240s CCD exposure with a 0.30m Newtonian telescope. 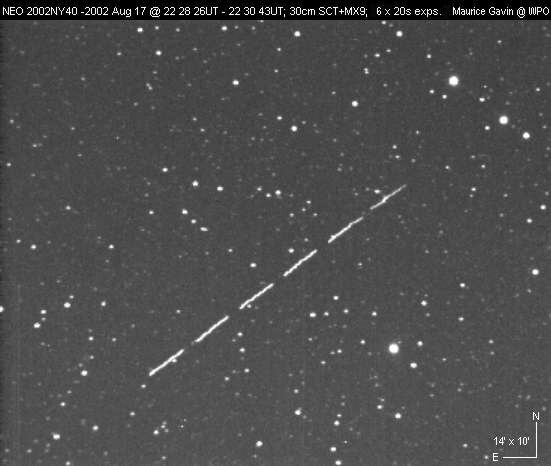 Chris Spratt writes: This picture taken on 1998 August 22 is a highly processed composite of four images showing the fast moving asteroid 1998 QP. 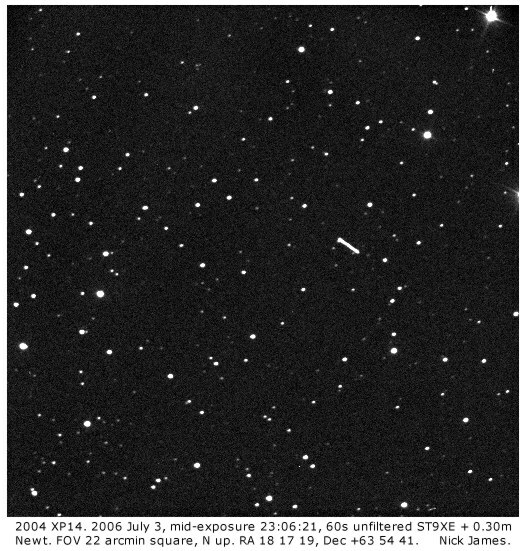 The telescope was a 4-inch TeleVue Refractor f/5.4, Starlight Xpress HX516 CCD with an IRB filter in system. Each image was 60 seconds. 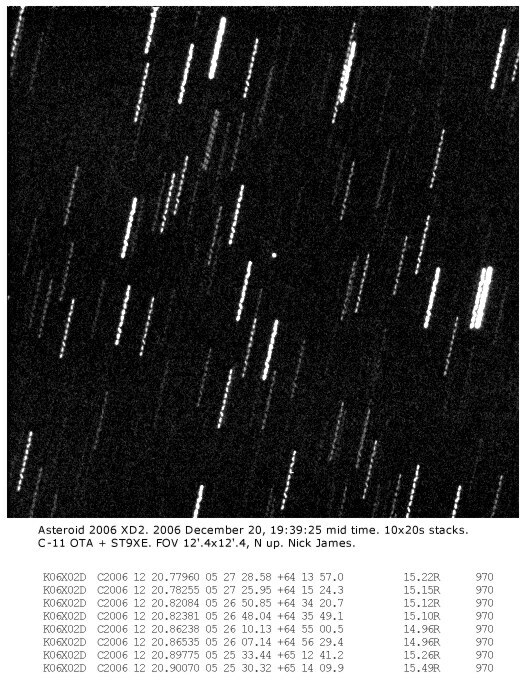 This asteroid makes a close approach to the Earth in 2001 December. 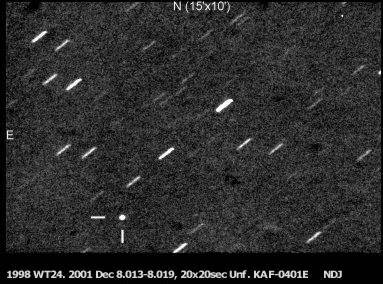 It passes only 0.013 AU (2 million km) from us on December 16 when it should be brighter than tenth magnitude for a while. 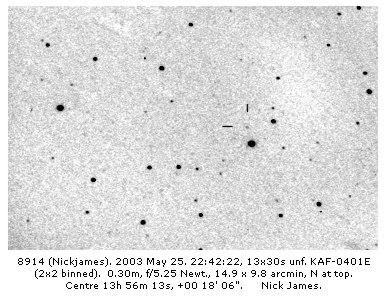 Nick James obtained this image on 2001 December 8. 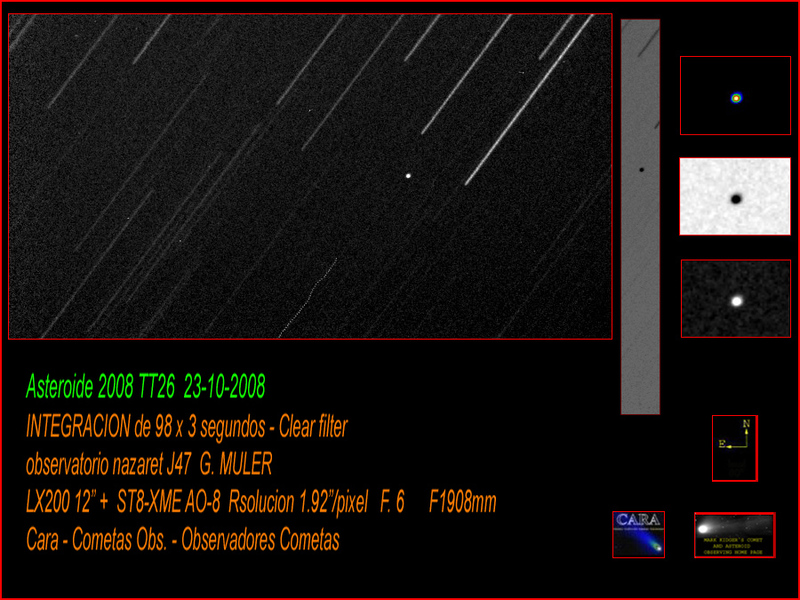 Also a short movie (1.6MB) made from exposures obtained on 2001 December 11 (James). 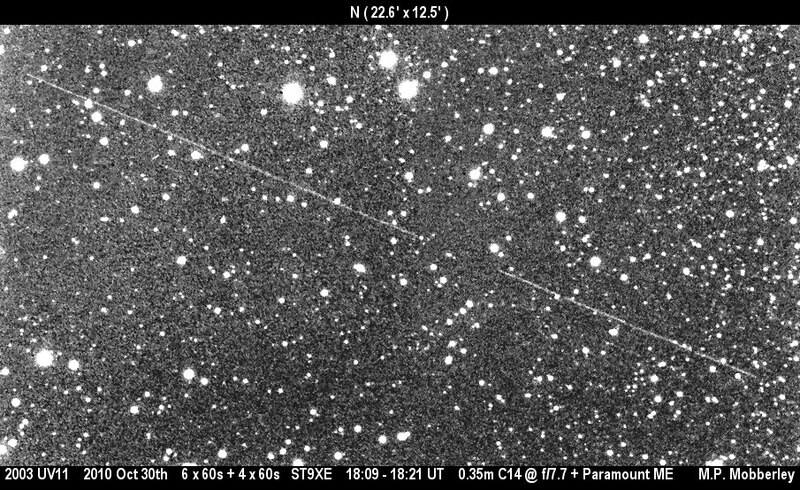 This movie is made up of 300 twenty second exposures showing the asteroid moving with respect to the background stars. 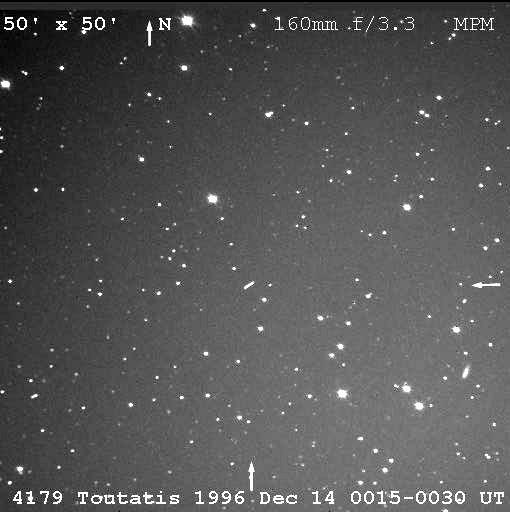 These 300 frames were used to generate this lightcurve. 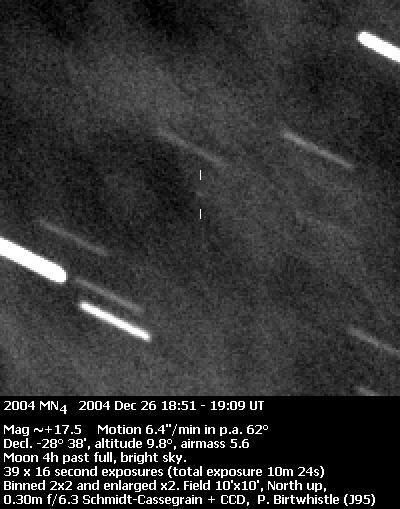 Other images: 2001 December 14 (Mobberley), 2001 December 14 (Waddington). 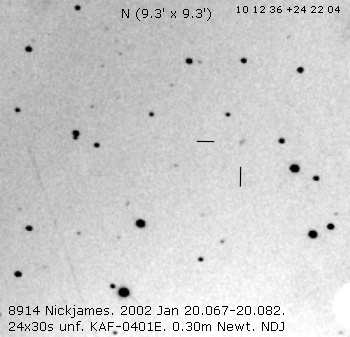 Nick James obtained another movie (1.8MB) on 2001 December 17. 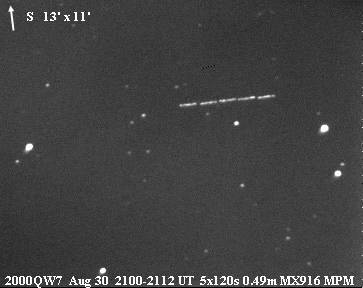 This one was made when the object was moving at around a degree an hour. 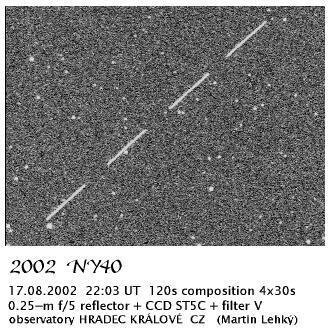 It is made up of 350 unfiltered CCD frames taken between 19:25UT and 21:04UT on a KAF-0401E CCD binned 2x2 at the focus of a 0.30m Newt. 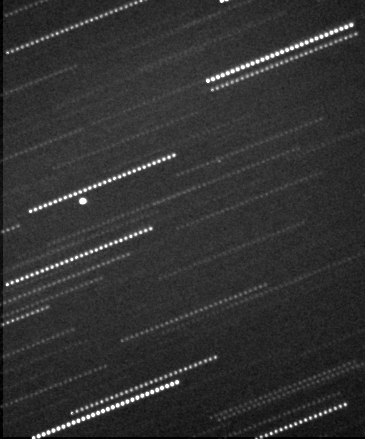 Each frame is a 10 sec exposure with around 7 sec dead time between the frames. The movie runs at 25 fps so it is running about 400x faster than real time. 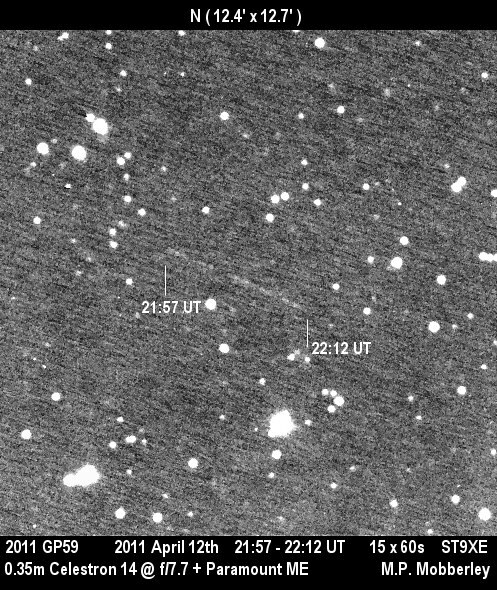 This bright, fast-moving asteroid was discovered by M. Blythe, F. Shelly and M. Bezpalko, Lincoln Laboratory ETS, New Mexico using the 1.0-m f/2.15 reflector and CCD. 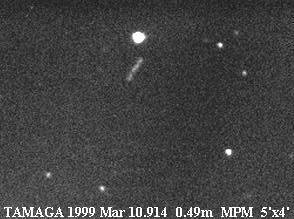 In mid February 1999 it was of 13th magnitude moving north in Leo. 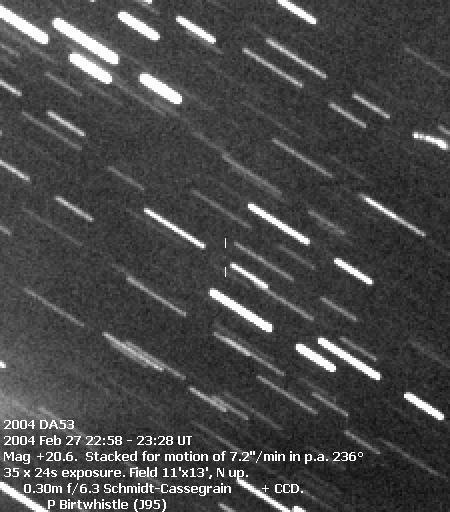 This image obtained on 1999 February 13 is a composite of 70 exposures taken over a period of two hours. 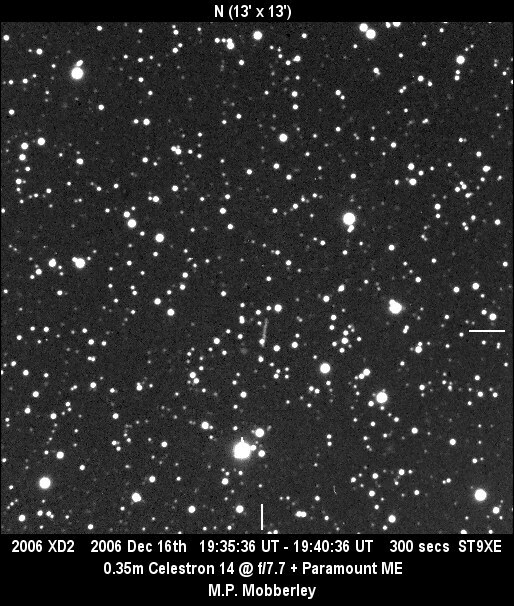 The exposures were used to construct a lightcurve which shows a variation of 0.3 mag in two hours. 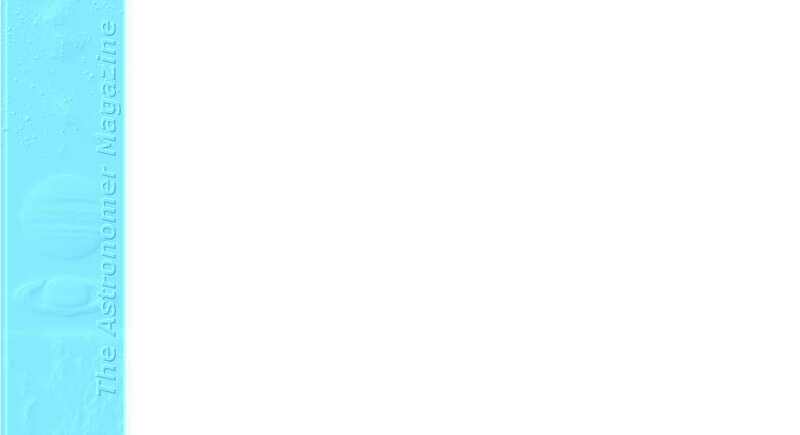 This is the lightcurve in GIF or Postscript. 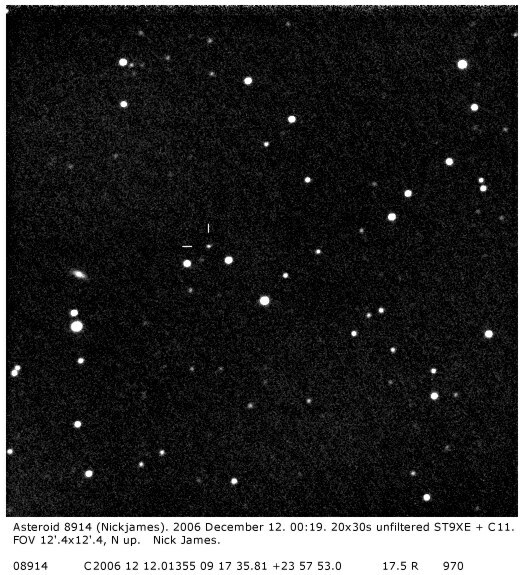 Denis Buczynski obtained a more comprehensive lightcurve over four hours on 1999 February 22. 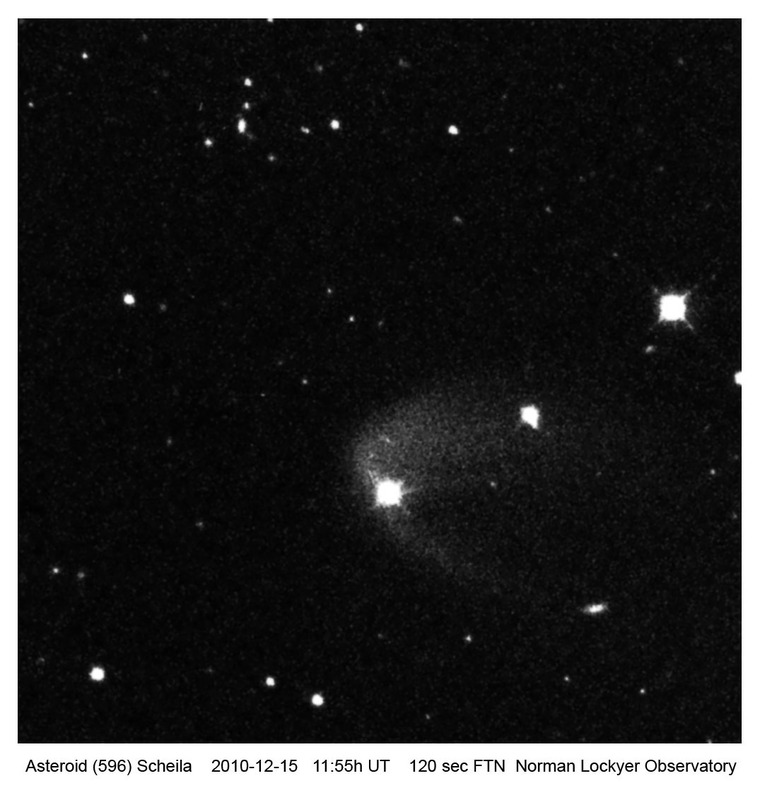 This asteroid was discovered by the Lincoln Laboratory team in New Mexico using a 1.0-m f/2.15 reflector + CCD. 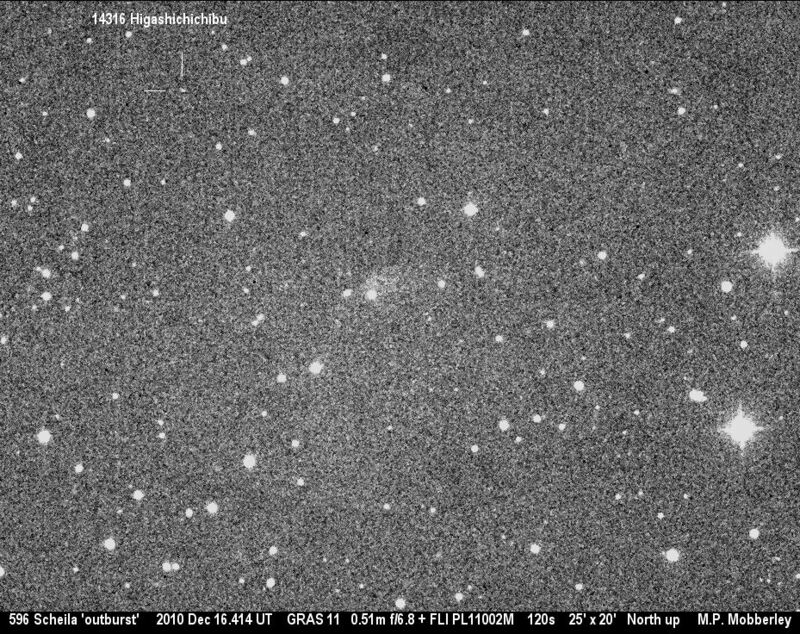 Observations put it as bright as magnitude 12 in mid 1999 April. 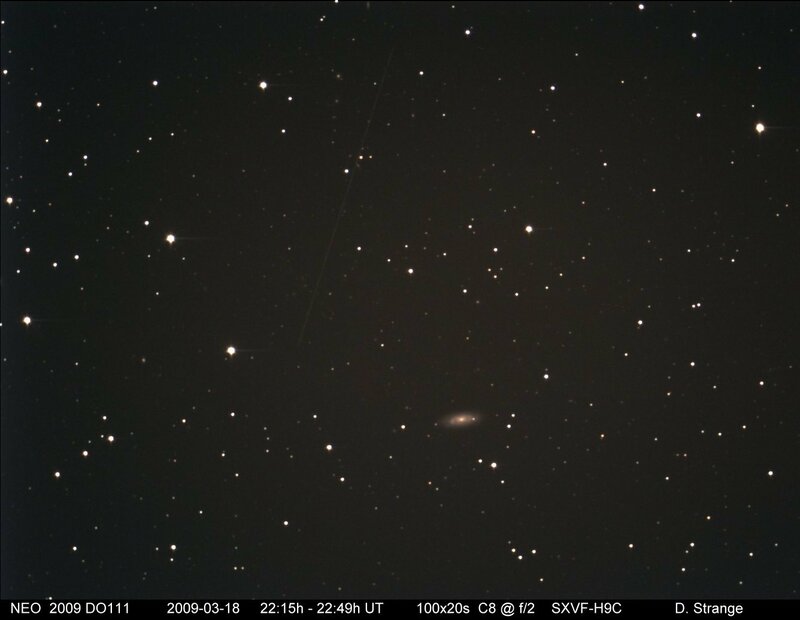 Martin Mobberley obtained an image taken using a 0.3-m LX200 & ST7 on 1999 April 16 despite drifting cloud and ice on the corrector plate! 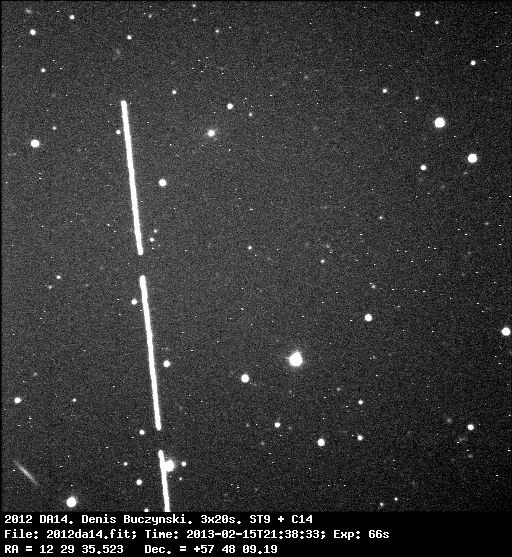 The trail on this image is approximately 70 arcsec long. 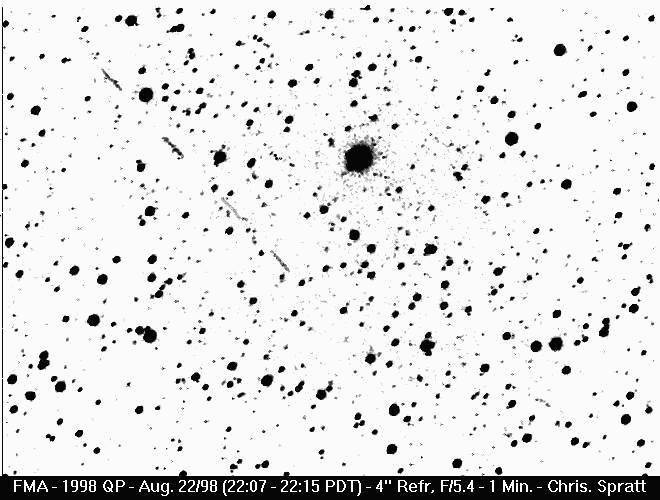 MPEC 2000-D35 reports that T. B. Spahr and R. E. Hill using the 0.41-m f/3 Schmidt + CCD of the Catalina Sky Survey (Station 703) have detected a relatively bright nearby asteroid. 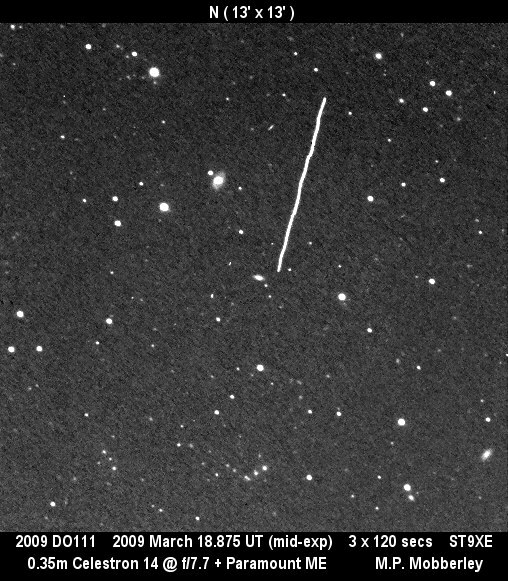 This image by Nick James taken on 2000 March 4 shows the fast moving object as short streak. 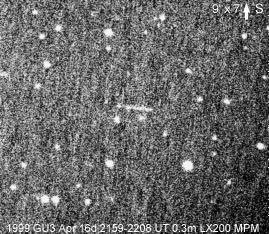 It is moving through Leo and it became brighter than 15th magnitude for a few days around 2000 March 8. 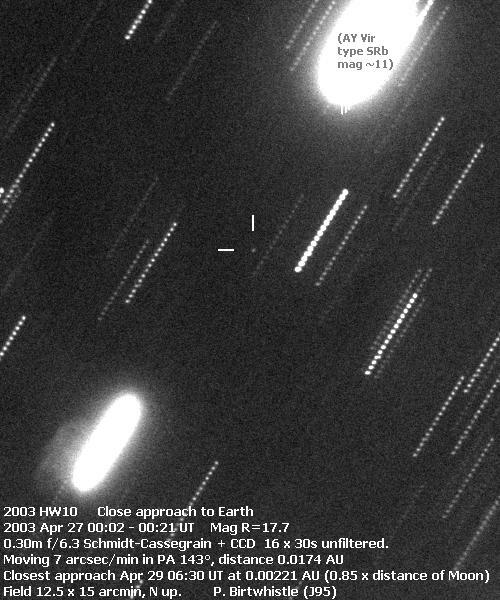 This bright Near Earth Asteroid was well placed for observation in 2000 August. 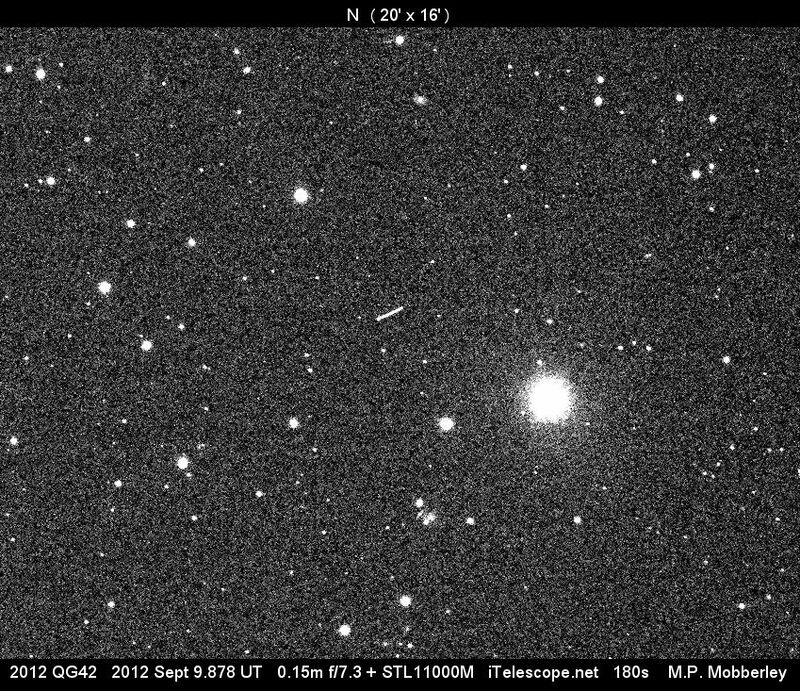 Denis Buczynski imaged it on 2000 August 29. 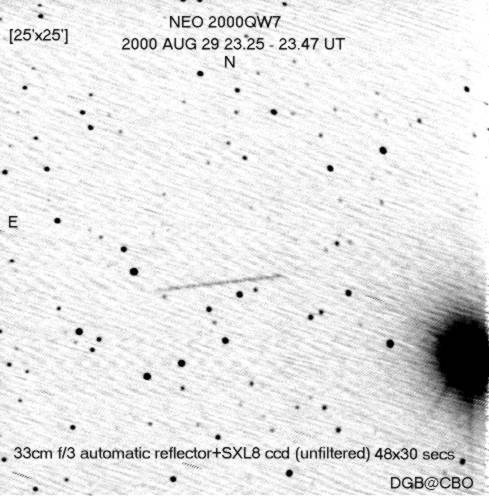 On the next day, 2000 August 30, Martin Mobberley obtained this image. 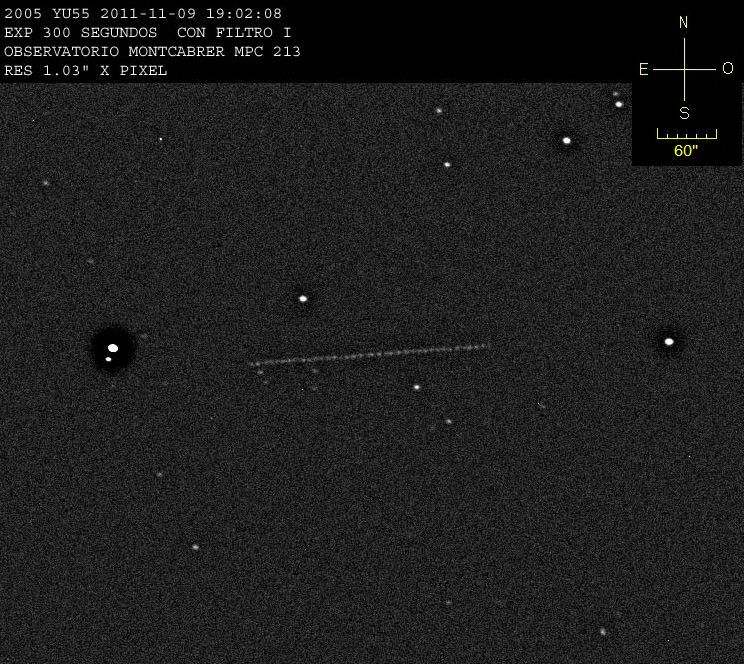 This NEO came to within 850,000km of the Earth on 2002 January 7. 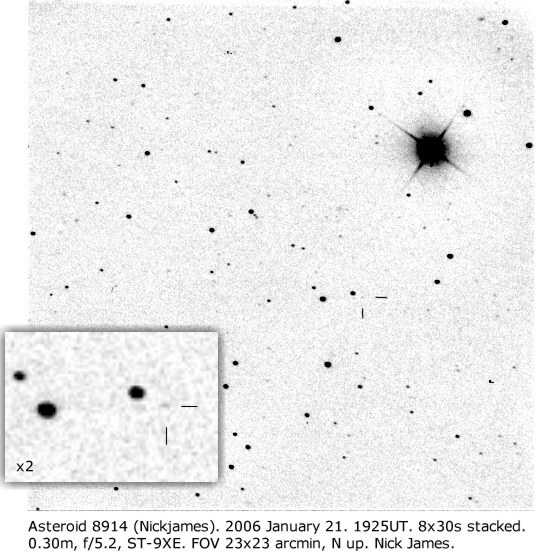 This image was taken in poor conditions with a nearby Moon on 2002 January 2 by Nick James. 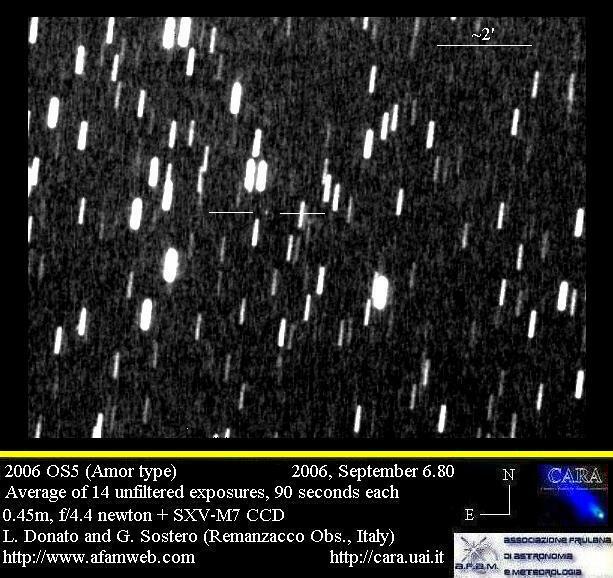 A large NEO that passed within 530,000 km of the Earth. Images: 2002 August 10 (Mobberley), 2002 August 14 (Mobberley), 2002 August 16 (Gavin), 2002 August 17 (Gavin), 2002 August 17 (Lehky), 2002 August 17 (Lehky), 2002 August 17 (J�ger), 2002 August 18 (James). 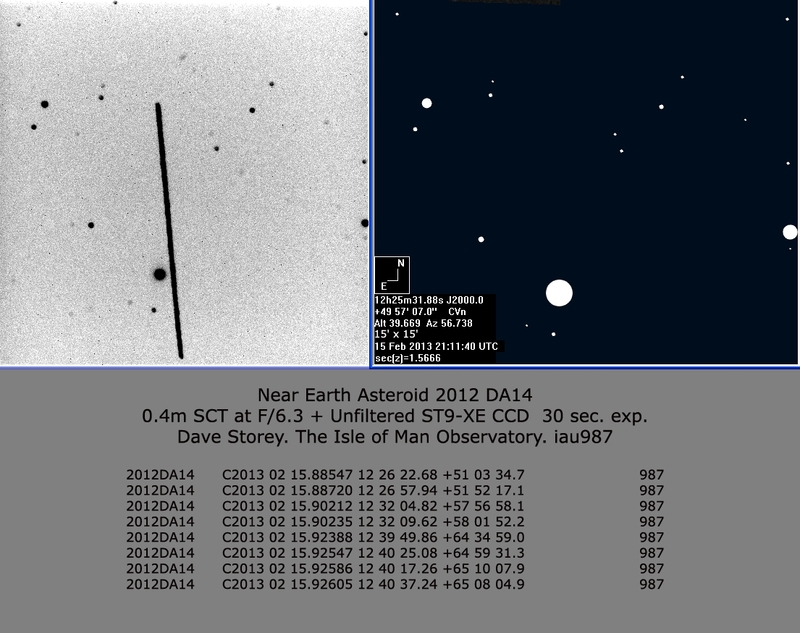 This asteroid is co-orbital with the Earth. See this site for more details. Images: 2003 January 12 (Birtwhistle). 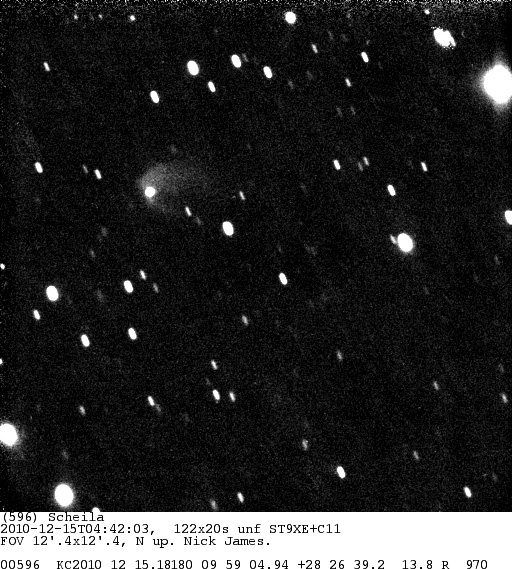 Imaged during close approach on 2003 April 27 (Birtwhistle). 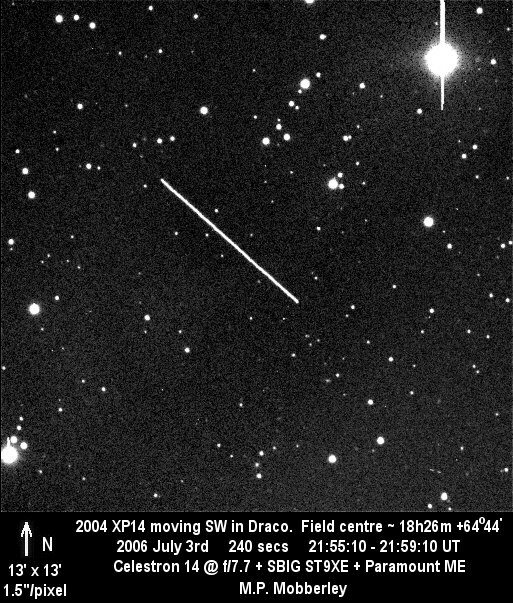 Imaged during close approach on 2003 September 25 (Birtwhistle) when it was moving at 50 arcsec/min. 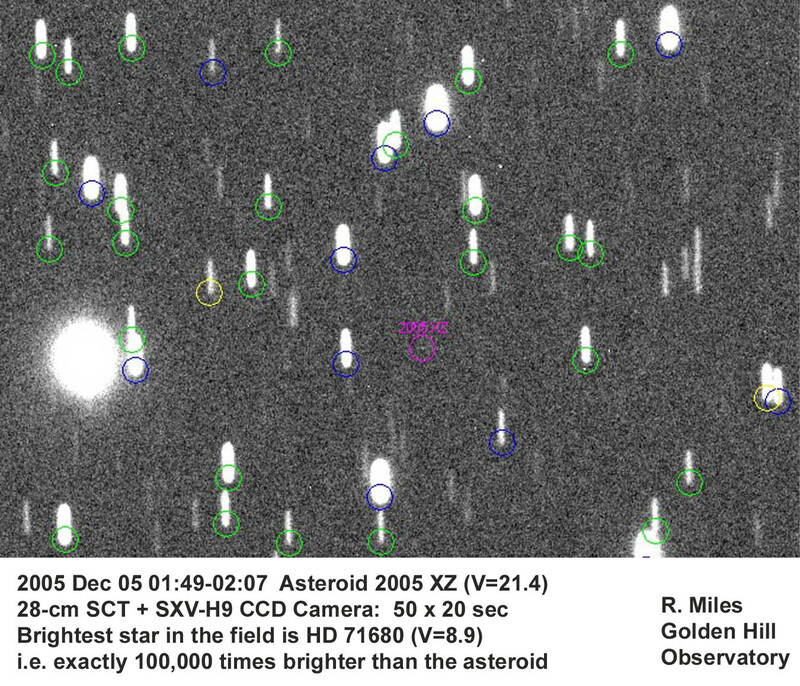 Newly discovered Amor asteroid. 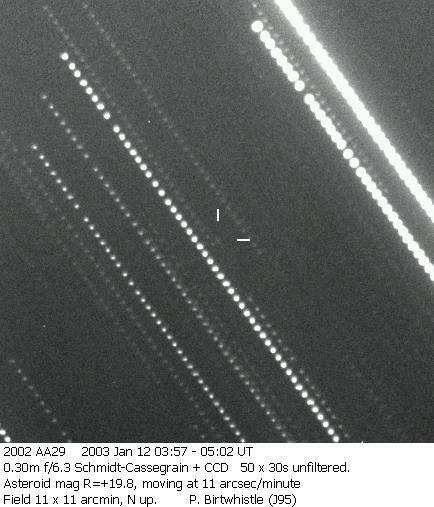 Image: 2004 February 11 (Birtwhistle). 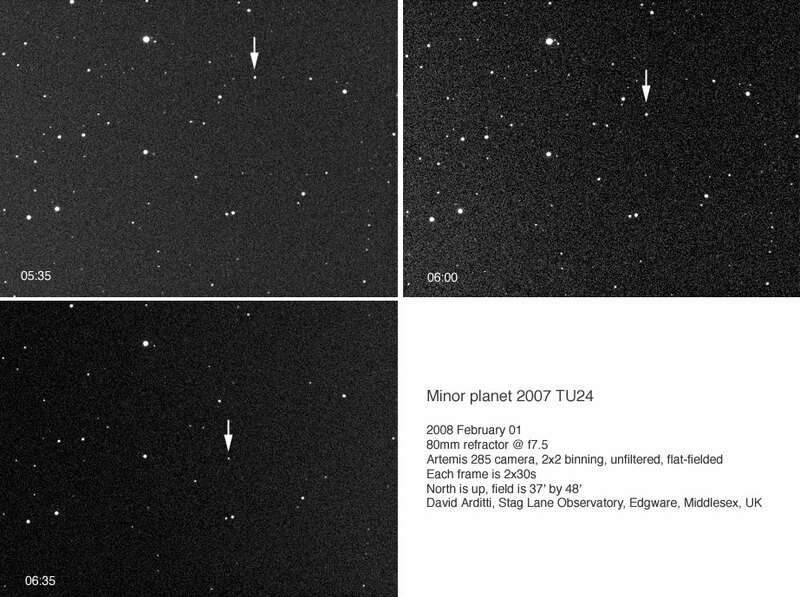 2004 February 22 (Birtwhistle). 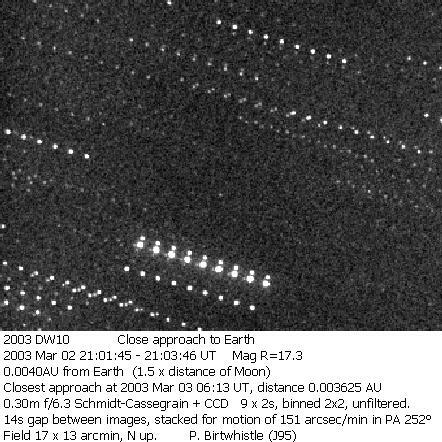 Passed six lunar distances from Earth two days after this image was taken. 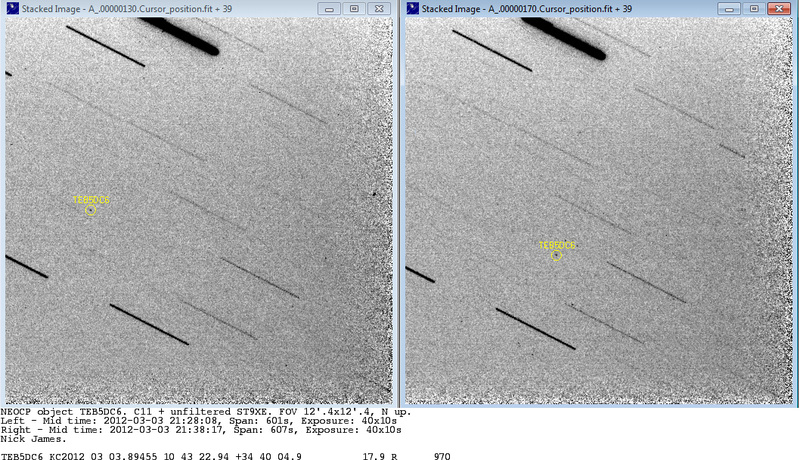 It was moving at 38 arcsec/min when imaged. 2004 February 20 (Birtwhistle). 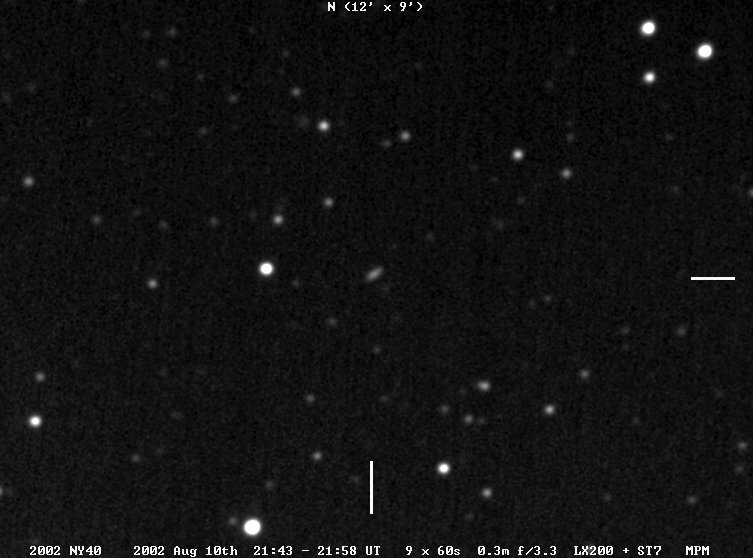 This small Apollo came to within 2.8 lunar distances 3 days before these images were taken and faded very rapidly in the 24 hours between images. 2004 February 27 (Birtwhistle). 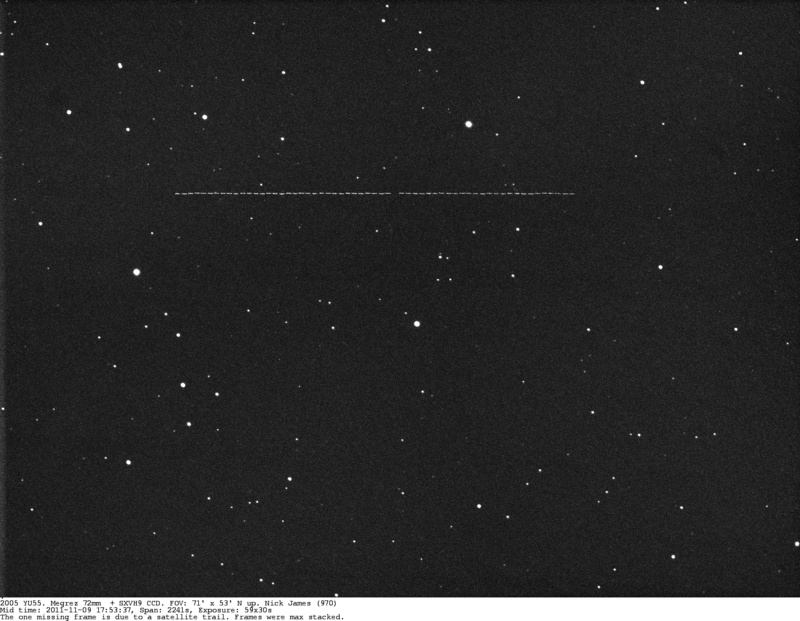 This a small Aten that came to just 1.3 lunar distances 2.5 days before the image. 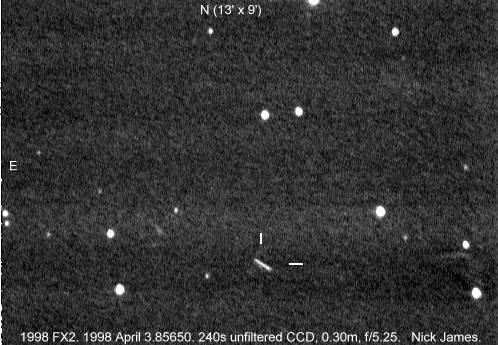 This also has turned out to be the last observation of this minor planet at this apparition. 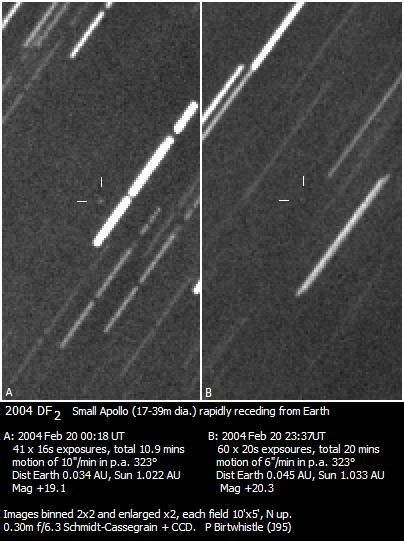 This Apollo was imaged by Peter Birtwhistle on 2004 April 3 (Birtwhistle). Temporarily a Torino 2 object. 2004 December 26 (Birtwhistle). 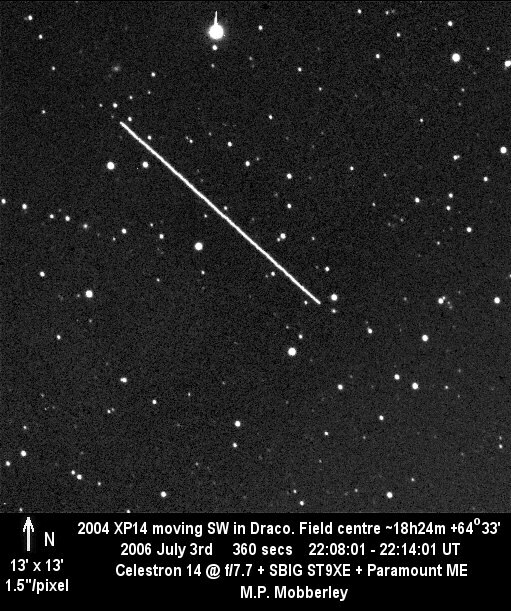 This object made a close appoach to the Earth on 2006 July 3. Images: 2006 July 3 (Mobberley), 2006 July 3 (Mobberley), 2006 July 3 (James), 2006 July 4 (Miles). 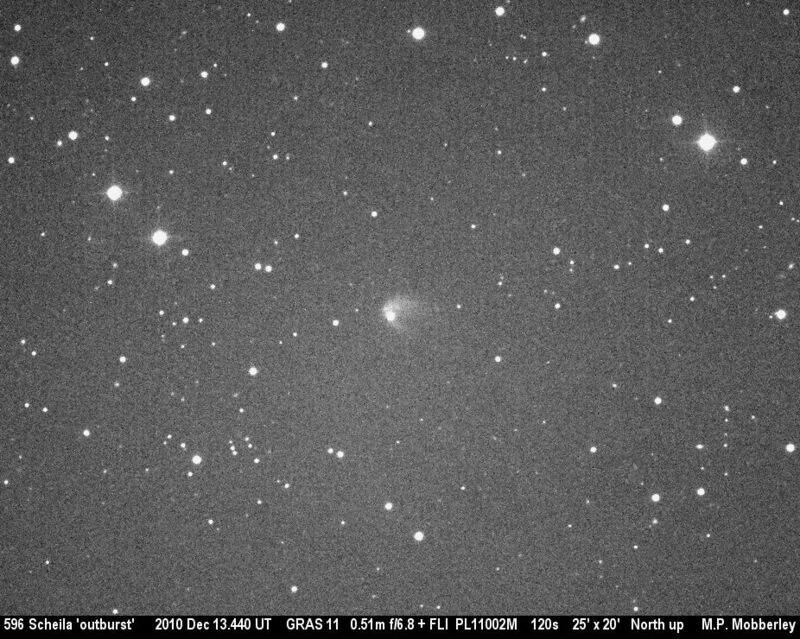 2011 November 9 (Campas), 2011 November 9 (Mobberley2), 2011 November 9 (Mobberley), 2011 November 9 (James). 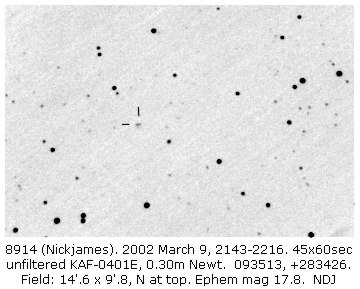 This 250m diameter NEO came close to the Earth in 2006 December: 2006 December 16 (Mobberley), 2006 December 17 (James), 2006 December 20 (James). 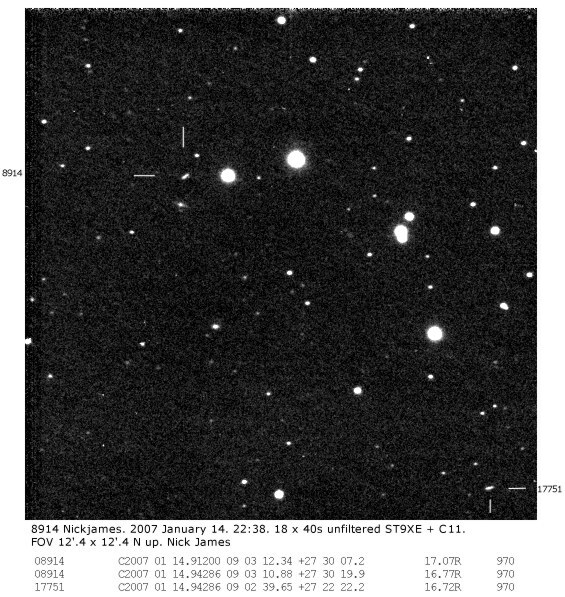 2008 January 27 (Mobberley), 2008 January 27 (Sostero), 2008 January 29 (James), 2008 February 1 (Arditti). 2008 February 2 (movie) (James). 2009 March 18 (Strange), 2009 March 18 (Strange), 2009 March 18 (Mobberley), 2009 March 18 (James). 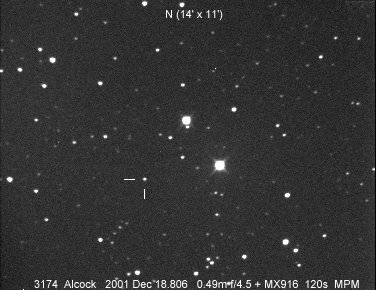 This NEO is probably the third (S-IVB) stage of the Apollo 12 Saturn V (SA-507) which entered Earth's orbit via the L1 Lagrangian point and will leave via the same route in 2003. 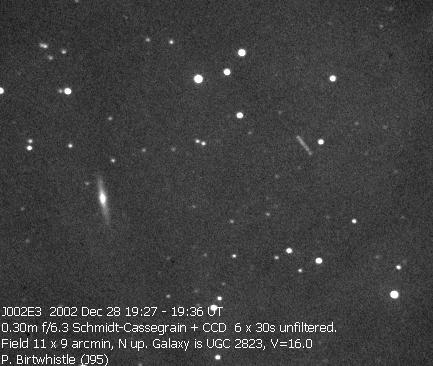 Images: 2002 September 15 (Luca/Andrea), 2003 December 28 (Birtwhistle), 2003 May 20 (Birtwhistle).